Low-carbers love this delicious substitute for pasta with Bolognese sauce. It’s everything you love about a spaghetti dinner, but without all the pesky carbohydrates in pasta. 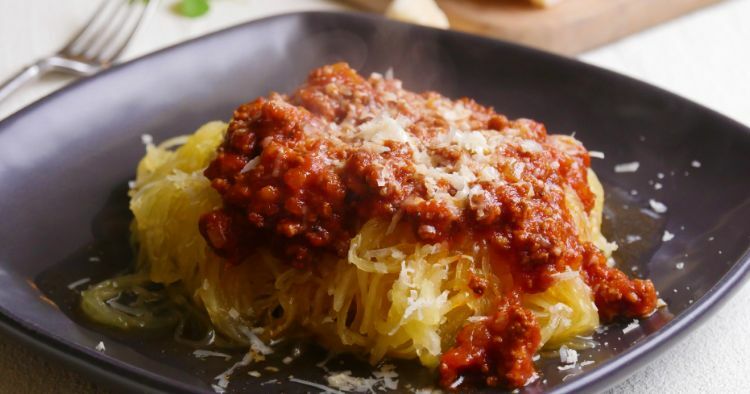 Using spaghetti squash as a pasta substitute cuts nearly all of the carbs out of this meal, but you still get to enjoy a meaty Bolognese sauce and a dusting of Parmesan cheese over long “noodles” that you can twirl on your fork. One of the best things about this recipe is that the squash cooks in the Instant Pot right along with the sauce; you’ll par-cook the sauce before adding the squash. These means fewer dishes to clean after the meal, and it makes preparation super easy. If you have die-hard pasta eaters at your table, it’s easy enough to make a pot of regular spaghetti noodles for them. This sauce is just as good on top of the carby stuff. Heat 2 tablespoons of oil in the pot using the sauté function. Add the beef and sausage and cook, stirring occasionally, until the meat is browned, about 5 minutes. Add the onion, garlic, tomato puree, tomato paste, oregano, salt and pepper. Stir to mix well. Close the pot, and turn the valve to the sealing position. Cook on high pressure for 25 minutes. When the cooking time is up, quick release the pressure, and carefully remove the lid. Give the sauce a good stir. Place the trivet in the pot on top of the sauce, and then place the squash halves, cut side up, on top of the trivet. Close the pot again, and turn the valve to the sealing position. Cook on high pressure for 15 more minutes. 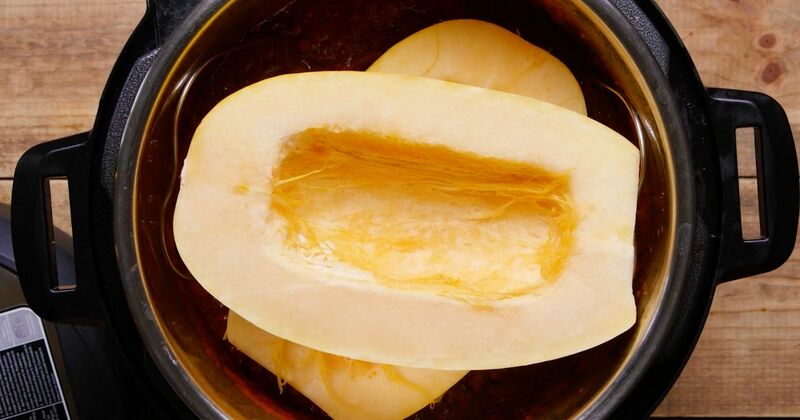 Remove the squash from the pot, and scrape out the noodle strands with a fork into a bowl. Remove the trivet from the pot, and ladle the sauce over the squash noodles.